Learn how to use Kichler lighting for an outdoor retreat. In my endeavors to research and provide really interesting considerations for homeowners on outdoor lighting, a name continued to pop up. That of Kichler Outdoor Lighting. Kichler Outdoor Lighting is a very well respected lighting provider that has taken outdoor lighting to another level. With the invention of the Kichler Outdoor Lighting Garden Collections, now people with a strong interest in making their outdoor space a carefully decorated work of art, here are some tools to help along the way. One challenge to decorating exteriors has always been the task of finding lights that matched one another, thus providing a very strong tread which tied the outside space together. Kichler Outdoor Lighting has masterfully solved this problem by providing eight different Kichler Outdoor Lighting Collections. Now even the most particular is bound to find a design that matches their exterior motif and has more than one type of light to choose from. Many of the Kichler Outdoor Lighting Collections are low voltage lights. Additionally two of the Collections - the Almeria and the Oak Trail - have outdoor chandeliers included in the collections. Personally my favorite is the Kichler Outdoor Lighting Almeria Collection. With strong roots in the old Spanish Architecture, it is really a lovely option. 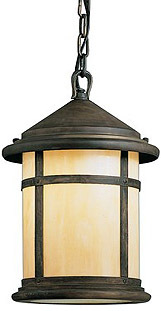 Also the Kichler Outdoor Lighting Cotswold Collection has a country manor flair that takes you back in history. 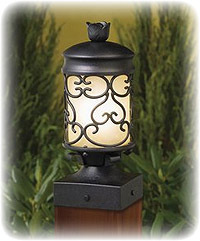 For a more modern look the Kichler Outdoor Lighting Zen Garden low voltage series is appropriate. Lodges should research the Oak Trail. 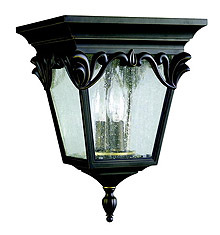 And for an English garden, Kichler Outdoor Lighting Ainsley Square Collection would be a great fit. So whatever your choice, take a look at Kichler Outdoor Lighting ideas, even if just to gain some ideas of your own.